And we do mean refugees. Several of our regular volunteers have been in Greece for varying periods over the summer and autumn of 2015. We have met thousands of people from Syria, and it’s so very striking (contrary to what so much of the media will say) that they are not coming to Europe for economic reasons. They are coming to feel safe. Because even in the light of the recent awful terrorist atrocities in Paris, Europe remains just about the safest place in the world to live. And living in Syria right now is so bad… well, it’s bad enough to make people risk open seas, in winter, on little more than rafts, with their entire family. It’s hard to imagine what it might actually take to make oneself choose that. But the bullets and bombs from every direction are driving up to 6000 people per day to cross to Greece. This post may seem more politicised than you expect from us. But the scope of the current situation is wide, and any real solution needs to come from a real confronting of the causes. We need to understand that this is a historic moment, and that Europe is unlikely to fully return to the protected bubble it has been for several decades. Educated, civilised people from regions long exploited and manipulated by imperial powers have been brutalised too far. And they have simultaneously realised that, while one individual illegally crossing a border may be shot at, when thousands of people are doing it, the system will break down. Then there’s the fact that now that the pathways have opened up, people are coming from much further afield, and poorer countries than Syria. We have met many from Iran, Iraq, Afghanistan, Pakistan, and even as far as Bangladesh. And it’s sometimes frowned upon, but not really much of a stretch, to say that many of these people are also refugees. They are seeking refuge. From countries with issues like: laws making it illegal to be gay; making it impossible to speak or write freely — or read freely, for that matter; elections that can’t be trusted; and sometimes just great difficulties in living or trade without daily corruption and violence. And that’s before we even begin to consider the daily injustices faced by women and religious minorities. There are bad guys in the story. But they are not the people arriving in Europe. Rather, they are the rich, uncaring smugglers, who take advantage of these people and take their entire wealth to send them out to sea in tiny, inadequate boats. They are so organised that they buy these boats in the thousands. They also operate a wide intelligence network, frequently changing routes to avoid authorities, and in doing so, often recklessly sending the poorest people to totally unsuitable, barren rocks in the Aegean. The richer people pay more for the islands with better processing; thus any small improvements made there are always one step behind the increasing number of arrivals. There are other bad guys. Where does the money come from for the people to pay the smugglers? Extraordinarily, sometimes the Syrians forced from their homes by crazy extremists and violence have actually been able to sell their homes. To who, in a war zone? Reportedly, from the mouths of the Syrians themselves, the purchasers are western corporations, cynically investing in the future of the country, and fuelling the smuggling operation in the process. And so to the response. After several months in Greece, we are shocked and saddened by the bulk of the response from the UNHCR, the aid agencies, the EU, and the Greek (and neighbouring) governments. Many municipalities are doing absolutely nothing (and worse, are actively obstructing efforts to help). The Greek people are suffering from this, as well as the refugees. The only explanation in some places seems to be that making more fuss and noise is intended to summon more money from the EU. And yet, unsurprisingly, outside those authority circles, the Greek populous has been unstintingly generous and full of solidarity. Voluntary groups are the major source of food for the refugees, and provide an awful lot more besides behind the scenes, including shelter, clothing, psychological support, and even sometimes ferry tickets for the most vulnerable. It is the volunteers, too, who mostly patrol the beaches to offer the very most crucial support to people as they wash up in the middle of the night, freezing, miserable, scared, and betrayed by the smugglers. Co-ordination efforts are slowly beginning to bear fruit. In some places the UNHCR has been exemplary at involving charities, and welcoming and respecting volunteer groups, to avoid duplication and co-ordinate activities. 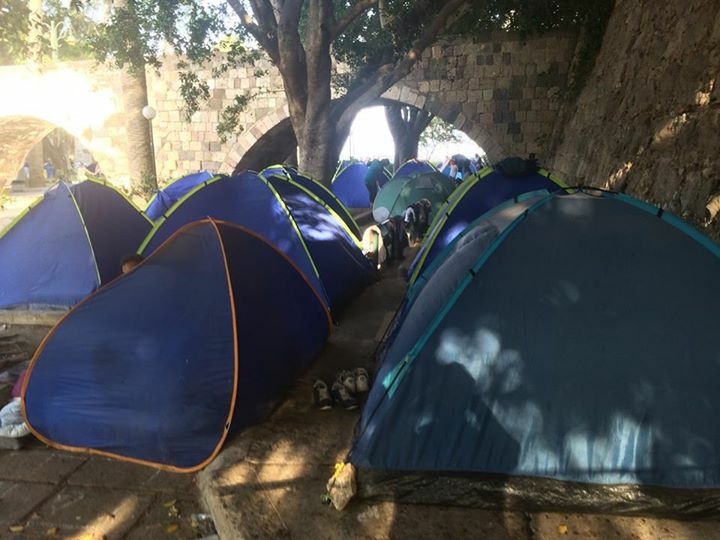 However, some of the camps, especially at Greece’s northern border, are suffering from a lack of management and nobody properly taking responsibility, which inevitably means that those organisations that are able to be reactive, together with the volunteers, are bearing too much of the burden. Moving forward, we will be supporting and advising more of our old friends and new volunteers as they return to various parts of Greece to support the people now beginning to be stuck as onward journeys are blocked by closed borders. With winter seriously setting in, conditions will only get worse. We very much hope the winter won’t reduce the number of volunteers available. If you want to help, we are currently happy to offer advice, and can point you in the direction of some of the pre-departure co-ordination which is evolving on social media. Travelling without this co-ordination is likely to be inefficient and may even be counter-productive so please do get in touch with us or another group before you go. Please note, we’re not currently in a position to offer funding to help anyone get to Greece — at this stage most volunteer travel is self-funded from local fund-raising or online crowd-sourcing. On the flip-side of that, if you are able to donate, we will be delighted to discuss with you how to make the most impact with your donation.